Powers/Abilities: Puff Adder possesses the mutant ability to increase his size and mass to an unknown extent. He generally increases his mass to about 2.5 times normal, increasing his height by about a third. He can emit highly acidic gasses via jaw control; these gasses are capable of eating through thick steel locks in a matter of seconds (whether these acids are internally generated or mechanical is unclear; see the Comments below). He apparently can change his skin and hair color as well, though it is unknown if he actually has control of this change (or if in fact this is not just a succession of perpetuated colorist's errors). Puff Adder is the Society's best pilot. (Official Handbook of the Marvel Universe, Master Edition) - Gordon Fraley was born in Atlanta, Georgia. he is a high school dropout and a mutant. His costume, and some acid-gas devices in the cowl, were created for Gordon by A.I.M. (Superior Foes of Spider-Man#9 (fb) ) - Puff Adder was at a Bar With No Name listening to Bullseye telling stories. (Captain America I#337) - In Las Vegas, Fer-de-Lance, Black Racer, Puff Adder, and Copperhead committed what was at least the second in a string of casino robberies; Puff Adder used his acid breath to get the team past high-security doors. However, after an alarm was tripped they were forced to hole up in a casino penthouse. 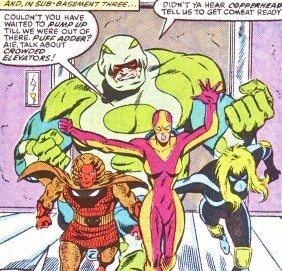 The Captain (Captain America under another identity), Falcon, D-Man, and Nomad invaded the penthouses and captured the quartet. (Captain America I#341/2) - Sidewinder introduced the four new Serpents to the charter members of the Serpent Society and appointed them as probationary members of the Society, with full status to be determined in three months time, and their first assignments to be given the following morning at 9AM. When the Viper's takeover happened Puff Adder was assigned to take down Diamondback, but she was with Sidewinder and the pair teleported away when Puff Adder broke down her door. (Captain America I#342) - Puff Adder and Coachwhip were initially set to stand guard over those Serpents who had refused to join Viper (Bushmaster, Black Mamba, Asp, Cottonmouth), but Puff Adder was later ordered out by Viper and subsequently encountered and was knocked out by the Captain, who had been called by Diamondback to help the Society. (Uncanny X-Men Annual#13) - Cobra accepted a commission from Ghaur (Deviant leader) and Llyra (Atlantean) to retrieve items of arcane mystic power; he split the Society into squads. Asp, Boomslang, and Puff Adder went to the Savage Land to retrieve a stone idol, but were interrupted by Wolverine and Dazzler. The trio retrieved the idol, but Wolverine ambushed them and took down Boomslang and Asp, while Dazzler knocked out Puff Adder with a well-slung rock; the X-Men retrieved the item and the serpents returned home. (Captain America I#355) - With Rock Python and Coachwhip, Puff Adder attempted to steal Sam Wilson's Falcon suit. Puff Adder remained outside, and attacked Battlestar when he plummeted from a window with Rock Python. Battlestar picked him up but Puff Adder increased his mass and size to the point that Battlestar couldn't move. The Falcon then attacked Puff Adder with Coachwhip's whips (still attached to her wrist). This distracted Puff Adder, and allowed Battlestar to knock him out. (Captain America I#365/2) - Puff Adder was present at a Serpent Society meeting when Cobra announced that a mystery man (Loki) had teleported into the Society's Bronx headquarters. Cobra asked the group to keep an ear out for information about the stranger. (Captain America I#367/2) - At a noon meeting of the Society, Puff Adder wondered if Cobra had realized that he wasn't cutting it as a leader and would be stepping down. Cobra emerged immediately thereafter and announced that he felt that he'd been underperforming as their leader and now intended to correct that and lead them to new heights as King Cobra. (Captain America I#380) - When Diamondback was captured by the Society to be tried for treason, Puff Adder and Anaconda brought Diamondback to her counsel, Black Mamba. Puff Adder acted as bailiff during the trial, and was part of the majority which voted for her death. Puff Adder was about to administer the lethal injection himself (under King Cobra's supervision) when Sidewinder teleported in and just as quickly teleported Diamondback out. (Captain America I#381) - King Cobra ordered Diamondback and Sidewinder's execution, with a doubled annual bonus to anyone who brought in their corpses. He ordered Anaconda, Puff Adder, and Rock Python to Diamondback's apartment. Captain America ambushed Anaconda and Puff Adder at her building; he disabled Anaconda but Rock Python quickly joined the fight and caught Cap, dangling him over the roof's edge by the ankle. (Captain America I#382) - Rock Python dropped Captain America (his shield absorbed most of the impact) and Python, Puff Adder, and the recovered Anaconda called King Cobra, who ordered them to leave the Captain and not return for 24 hours, in case he was faking. (Captain America I#385/2 - BTS) - Puff Adder remained in their ship while Anaconda and Rock Python attacked Black Mamba, Diamondback, and Asp at Diamondback's apartment. (Captain America I#387) - The Avengers received reports that two Serpent Society members (Rock Python and Adder) were found unconscious in Bay Ridge, Brooklyn. (Guardians of the Galaxy#28) - Puff Adder was part of a "Masters of Evil" team of super-villains collected by Dr. Octopus to invade Avengers Mansion while those heroes were occupied during the Infinity War crisis. 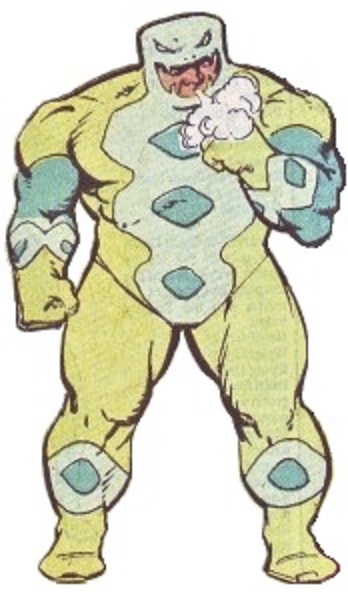 Octopus created two separate squads of villains, with Gargantua and Shocker, Puff was part of his second, back-up, squad. (Guardians of the Galaxy#29) - The time-traveling Guardians of the Galaxy defended the mansion, and Puff Adder ended up fighting Major Victory until both were interrupted by their own evil doppelgangers (created by the Magus as part of the Infinity conflict). The Guardians convinced Dr. Octopus to ally with them and they defeated their doppelgangers together. After that fight concluded Octopus ordered his team to attack the Guardians but they refused, Puff Adder saying "these guys saved our butts." Puff Adder and the other back-up Masters chased off Dr. Octopus. (Captain America I#411) - Puff Adder was sitting with Anaconda in the crowd at an AIM weapons expo on Boca Caliente where Crossbones fought five foes (Mad Dog and Ramrod came first)in a prearranged match. (Captain America I#412 - BTS) - Puff Adder watched as Crossbones defeated Sumo, Razor-Fist, and Batroc before Zaran and Batroc announced that Crossbones was really Captain America and offered $50,000 to whomever took him down. (Captain America I#413) - Puff Adder was among the many villains who attacked Captain America en masse; the Captain eventually escaped. (Captain America I#414) - Though Captain America had fled the fighting continued, Puff Adder and other villains ended up brawling outside the building with Shang-Chi and the Falcon, until that pair also fled. (Captain America I#434) - In a small town in Arizona, King Cobra, Anaconda, Coachwhip, Cottonmouth, and Puff Adder interrupted Jack Flag's defeat of Fer-de-Lance and Rock Python, who had just robbed a bank. Flag announced he wanted to join the Society; Anaconda knocked him unconscious and they took his body along. Puff Adder piloted one helicopter with King Cobra and Jack Flag; King Cobra sent him on an initiation test, and then double-crossed Flag by calling Mr. Hyde and pre-warning him, Hyde being the owner of the painting that Cobra had sent the clueless Flag to steal. The next morning at the Sandhaven Community Center, Puff Adder was present when Flag surprised King Cobra by showing up with the painting. (Captain America I#435) - King Cobra auditioned Jack as his eventual replacement as King Cobra, forcing him to run a gauntlet of the Society serpents, including Puff Adder. The fracas was interrupted when Mr. Hyde showed up and took down Puff Adder. Puff Adder soon recovered and rejoined the others, who had captured Captain America. When Coachwhip was revealed to be a disguised Free Spirit and Jack Flag revealed himself to be an enemy of the Society, Puff Adder was one of those left to attack the pair. (Captain America I#436) - Puff Adder pursued Jack Flag and Free Spirit when they tried to escape. (Captain America I#437) - Puff Adder and the Society had Jack Flag and Free Spirit cornered when Force Works (an Avengers' offshoot) came to the pair's aid; within four minutes the Serpent Society was defeated. They were taken into custody by the team. (Deathlok II#7) - In Hollywood, Puff Adder watched Tanya Sealy (Black Mamba) at her table at a Hollywood charity event. He waited until her date went to the restroom to approach and ask her to return to the Serpent Society, saying that though things were a little messed up right then, they were coming back together. Her date tried to drive Puff Adder off, even throwing the first punch, and when Puff saw he was part machine he breathed acid at him, revealing him to be Deathlok, and Deathlok and Puff Adder were soon brawling. The fight went through walls and into the street, but when Puff Adder was knocked down after Deathlok launched missiles at him, Tanya intervened and stopped the fight, taking the wounded Puff Adder away in a limousine though she had no interest in returning to the Society. (Captain America IV#30) - Bushmaster, Puff Adder, and Asp burst in on Captain America's apartment. Asp blasted both him and Diamondback (really an LMD) knocking out Captain America but not Diamondback, and noted to the others that her blast should have knocked out Rachel as well. Puff Adder was present in the Society's underground New York-area headquarters when Captain America and Diamondback awoke, chained to a pillar. (Captain America IV#31) - Puff Adder was there while King Cobra taunted Diamondback, promising to punish her for her betrayal. Sixteen hours later, King Cobra had arranged an auction for the disposal of Captain America and had Anaconda and Puff Adder take the Captain down. Cap escaped, knocking out all of them. S.H.I.E.L.D. subsequently took Puff Adder and the rest of the Society into custody. (Amazing Spider-Man I#562) - With several of his fellow serpents (Coachwhip, Rattler, Rock Python) and in the company of other criminals, Puff Adder patronized a Bar With No Name in New York City, where he and the others watched the Basher challenge Spider-Man to a fight via YouTube. Bets were placed on prospective results of the fight, and that night, he returned to the Bar to watch the fight on TV (not only did one Spidey show but two did, leading to accusations that the bets were rigged). He was still at the Bar later when Spider-Man showed up there. (Amazing Spider-Man I#563) - Puff Adder and the other criminals in attendance battled Spider-Man, but stopped when the bartender reminded them that the Bar With No Name was a sanctuary for those being hunted by the law - which currently included Spider-Man. Spider-Man then pressed the bar's occupants for information on the Bookie; the bartender gave him a lead and he left. (Amazing Spider-Man I#700.3) - Puff Adder and Flying Tiger were watching TV at the Black Lodge when Peter Parker, bandaged up beyond recognition, rolled in on a wheelchair and joined them. They were soon joined by Eel and Shocker. Peter realized that he was among supervillains when Shocker put on an updated mask created by the Tinkerer. (Amazing Spider-Man I#700.4) - Puff Adder joined Flying Tiger and Eel in fighting the still bandaged up Spider-Man. During the fight Spider-Man tossed Eel at Puff Adder, who crashed through a window, falling down several stores. Puff Adder apparently fled when he saw the Black Lodge going up in flames. (Avengers vs. X-Men#0) - Puff Adder teamed up with Serpent Society teammates Anaconda, Asp, Bushmaster and Cottonmouth, robbing a bank and holding hostages. Hope Summers attacked them and knocked the villains out, copying Puff Adder's mutant strength and using it against him. (Gambit V#8) - Puff Adder was at the Club With No Name in Manhattan when Joelle arrived. (Gambit V#9) - Puff Adder was among the villains at the Club With No Name who fought Gambit and Joelle when they caused a scene. (Captain America: Sam Wilson#3) - Puff Adder and Cobra served as bodyguards to Viper at a meeting with representatives of the cosmetics industry. They were worried Captain America (Wilson) would come after them following the capture of Dr. Malus, but Viper assured them Malus was only one of many scientists hired by Serpent Solutions. (Captain America: Sam Wilson#4) - Puff Adder and Cobra served as bodyguards Viper at a meeting with several influential people from Wall Street. When Greg Williamson, senior vice president for public relations and community affairs, called Viper a criminal and wanted nothing to do with whatever he suggested, Puff Adder and Cobra stopped him at the door. Cobra apparently killed him. Later Puff Adder was at a meeting of Serpent Solutions in a conference room with Captain America (Sam Wilson) as captive. Captain America, who had temporarily been turned into a wolf/human hybrid, had just been captured by Serpent Solutions members Black Racer, Copperhead, Cottonmouth and Diamondback. (Captain America: Sam Wilson#5) - Puff Adder was present when Viper (Dixon) monologued to Captain America (Wilson) about how Wilson was destroying America and Serpent Solutions' businesses. Viper ended the monologue by shoving Cap, who had been paralyzed by Asp and was bound to a chair, out a window. He was saved from certain death by the new Falcon (Torres), who was then confronted by Serpent Solutions, including Puff Adder. (Captain America: Sam Wilson#8 (fb) - BTS) - Puff Adder was imprisoned by S.H.I.E.L.D. in Pleasant Hill where his reality was rewritten by a Cosmic Cube. (Captain America: Sam Wilson#8/All-New, All-Different Avengers#8) - Freed from his false reality Puff Adder joined forces with Baron Zemo and other villains to take down Pleasant Hill. (Captain America: Steve Rogers#13) - Baron Zemo met with Serpent Solutions to ask them to join his Army of Evil. Puff Adder was one of the members joining him. In Captain America I#434-437, Puff Adder is occasionally given black skin and occasionally given white skin. Prior to this point, he had always had white skin. He is black-skinned again in Deathlok II#7, and white-skinned again in Captain America IV#30-31 and Amazing Spider-Man #562-562. In Captain America I#434-437, Puff Adder is named as Willard. However, his real name is given in his OHOTMU Master Edition entry as Gordon "Gordo" Fraley. I've listed Willard here as an alias/nickname. The Master Edition entry also identifies him as a mutant. Since the depowering of many/most of the world's mutants after the House Of M crossover, Puff Adder has only once again appeared in Amazing Spider-Man I#562-563, and didn't use his powers there. So, we do not know if he still maintains his powers or not, though it seems pretty dumb to still be wearing the costume if he has no powers! He still has his powers so he either wasn't depowered or he was never a mutant to start with. The Master Edition entry also notes that his poison gas emission is mechanical and not an innate power, and that his costume came from AIM. However, it should also be noted that despite the Master Edition's statement, in Deathlok III#7, despite lacking his costume Puff Adder is still able to breathe acid at Deathlok. Perhaps the cowl lets him project different acids besides his natural ones? Or perhaps he's had the cowl's technology implanted inside his jaw? In Captain America I#365 & 387, Anaconda is flirting with or "dating" Rock Python. In Captain America I#435 she refers to Puff Adder as her "main squeeze" but the art there is really iffy -until I realized he showed up later I thought this _was_ Rock Python. I suspect that Mark Gruenwald intended the comment in #435 to be about Rock Python as well, but I can't be sure - either Blanche was dazed during that fight and lost track of who was behind her, or she'd moved on from Python to Adder. Iron Man Legacy#7-8 occurred shortly after Tony Stark had lost control of Stark International to Obidiah Stane. There is even the cover of Iron Man I#173 (August, 1983) seen as Wall Street Journals' cover in Iron Man Legacy#6. This is a bit problematic because the Serpent Society wasn't even founded at that point and Puff Adder had joined the Society as an infiltrator even later in a story printed in 1988. Maybe he got kicked out and this was Sidewinder's first attempt with a smaller roster to establish themselves. Puff Adder is seen on the cover of Avengers: The Initiative#1.